Waterbase produces wide range of aqua feeds from its plants installed with advanced pelleting technology machines and fully automated computer controlled operation. Formulations are designed by International shrimp feed nutritional experts, tested in real-time R&D farms before supplying the feeds. Feed ingredients sourced from indigenous and imported sources undergoes multi-layer inspection processes before issue for production. Implementation of stringent Quality Assurance protocols ensures production processes are closely monitored and controlled and finished feed quality is maintained to the guaranteed specifications. Because multiple farmers across the country trust us. Because we invest in R&D, to better meet your every increasing need. Specially designed for each species - P.Vannamei (White shrimp), P.Monodon (Tiger shrimp) and Scampi (fresh water prawn). 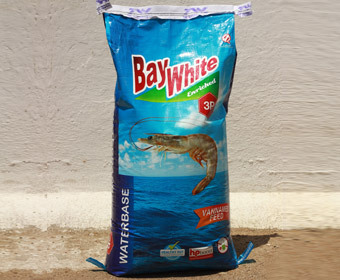 Bay White is the first successful Indian brand developed for “Vannamei" shrimp (Litopenaeus vannamei) farming. 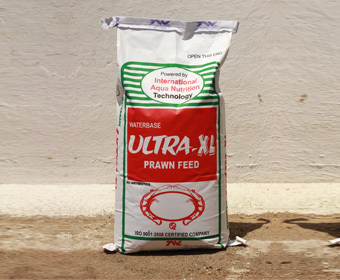 It is formulated as balanced feed with all essential nutrients required for producing healthy shrimps. A mixture of highly digestible marine and vegetable proteins from a perfect mixture to match the ideal protein specification for the Indian white shrimp. It contains natural sources of phospholipids, cholesterol and omega-3 fatty acids to fulfil the shrimp’s requirements. HP Boost concept in Baywhite assists shrimps to digest and absorb fats more efficiently, resulting in enhanced food absorption. The use of a synergistic blend of selected natural anti-microbial compounds limits the growth of pathogenic bacteria such as Vibrio sp, and promoting the beneficial bacteria sp as Bacillus sp. Ultra XL is especially formulated to meet the nutritional needs of "tiger" shrimp (Penaeus monodon). Ultra XL is nutritionally balanced and cost effective to meet the complete nutritional requirements of semi-intensive culture of Tiger shrimp. Products are manufactured through ISO Certified Quality Assurance Program to ensure that farmers will receive the consistent, high-quality diet that will enhance the survival, growth and lower FCR. Ultra XL is designed to have better drawing power and water stability to minimise the wastages. All feed ingredients undergoes rigorous selection process and quality inspection methods to assure maximum digestibility and nutrition is available to the animals. 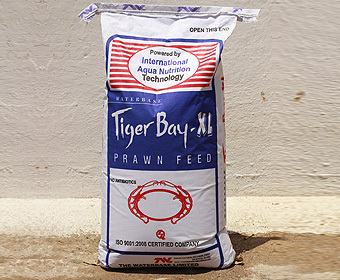 Tiger Bay XL is designed with boosters to stabilise the osmoregulation and enriched omega-3 fatty acids enables the feed perform better in varied culture conditions, especially on varying salinity conditions. 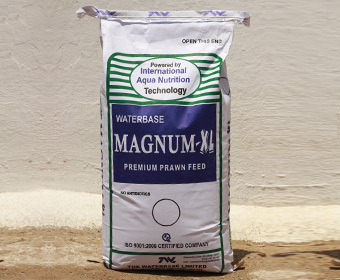 Magnum is having high water stability and very low dust development, ensures better nutrition availability to the animals. Magnum also deliver better results in mixed farming, rearing scampi and tiger prawns. Waterbase maintains a feed distribution network of over 100 distributors and dealers along India’s coastal belt, and is committed to supporting its distribution network with qualified and trained personnel who provide 24x7 services on everything from instruction in farming techniques to advice on various developments in the Industry.